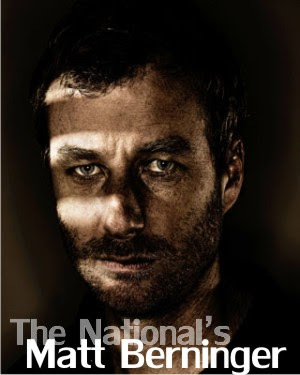 If you haven't heard of The National by now, well, where have you been? A slow but steady buzz has been building over the last few years on the internet, in the press, and by drawing into their fan fold such rock icons as Bruce Springsteen and REM. Last year one of the best pop culture magazines on the planet, Paste, named their latest album, Boxer, as best record of 2007. In six short questions, the band's main man and lyricist, Matt Berninger, talks to Sixeyes about dicks, socks, and closing your eyes. No, really. Yeah, I know what you're thinking, but this is a grown, mature man, a man who nearly named his current band American Mary (no, really). A grown man who took the time to do this Q&A even while the band's on tour in Europe, the guy's a peach, so back off. Speaking of touring, you should check the dates below. Tell me how you and the band lucked into a gig opening for rock icons REM? Michael Stipe came to a few of our shows last year in Europe and seemed to be a genuine fan. We eventually met him and Mike Mills in London and talked for a while. I think they wanted to see what kind of guys we were off stage just to make sure we weren't dicks. A few weeks later we got the call. How big a break do you figure this opportunity was for The National? Opening slots on huge tours are usually thankless endeavors, but opening for REM is a different story. Sonic Youth, Wilco and Radiohead have all opened for REM. We knew we'd be playing early in half empty venues to mostly people who had never heard of us but we thought it was a worthwhile challenge. We were confident that we could turn some heads. I was wondering if anything about Modest Mouse and/or REM, surprised you when you saw them perform? I can't say it was a surprise, but REM put on amazing shows every single night. They all looked happy and never once phoned it in. They changed their set lists dramatically from night to night and played around 85 different songs over the course of the tour. They had a very visible respect for their audience and delivered the goods. We learned a lot. What was the biggest difference between touring these big venues as opposed to being the headliner in the smaller venues which have been your bread and butter? Better catering and bigger echoes. We've played some big festivals so we weren't completely out of our element. If I started to get rattled I'd just close my eyes. That's my go to defense mechanism. Are any of the band members big REM fans from way back? And if so, could you give me an idea of what it would be like to meet one of your heroes? I think we're all fans of REM from back in high school. There's an initial surreal sensation when you're talking to someone in real life that you've only seen in photos, or on TV. You've spent so much time with them over the years through their music and now you're here talking to them about crappy movies, or the best place to buy socks, or whatever. It takes a second to get used to, but pretty quickly you're just talking. Finally, what did this tour teach you that all the others before didn't, if anything? It mostly made us see that there are healthy ways to do this without ruining yourself. BUY The National's music here. Download their music via eMusic's free trial offer... look into that here. i'm not too proud to beg. i'd love to listen to the full set. Me too, Alan, that'd be sweet. Thanks for a great little feature. Hey Alan- I'd love to hear the full set. Saw Frightened Rabbit last night and they broke into the first part of Fake Empire before transitioning into Backwards Walk. The Brooklyn crowd was loving it. I'll be the third to beg for the ACL set -- Ohio boys in Austin...it's a good combo. Adding my voice to the beggars' chorus. I can do embarrassing prostrations if it will help. Oh I love the feeling of power! Your wishes have been granted and your begging approved, the rest of the set has been posted in a new post!